You are a Scorpio if you were born between October 24th through November 22nd, depending on the year. The Scorpio woman personality leads an unbalanced life. Almost every aspect of her life seems to be on one extreme or another. The Scorpion lady can feel like she can do anything, or she will feel entirely insecure. It can be difficult to understand the Scorpio woman fully. 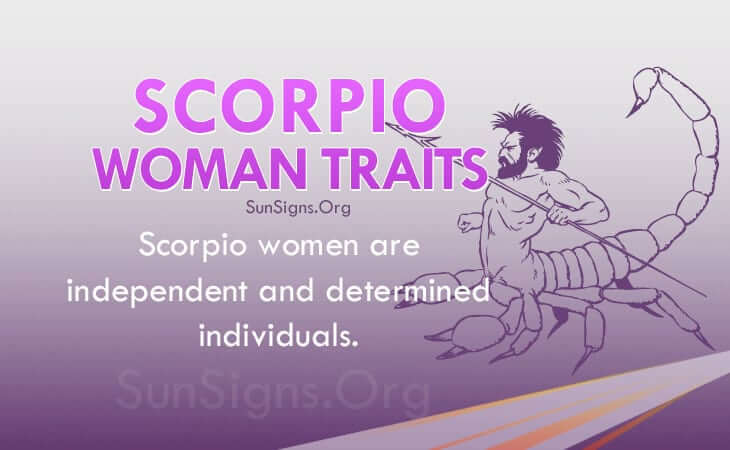 But the Scorpio woman personality traits show that with enough time and persistence anyone can be more easily recognized for who they indeed are on the inside, even when they do not readily show it on the outside in their daily lives. Scorpio women are independent and determined individuals. They will only strive to reach high goals, and they will let nothing get in their way of accomplishing these goals. She will want to have a high-profile career or be the center of a group or club. This way she can make sure that everything is being done correctly. The Scorpio female often feels uncomfortable when something is not right in her world, especially if it is something that she should have been able to control. Also, having a high-profile job or being in charge of a group will give her a higher social status that will have people noticing her more, which she will take pride in. The Scorpio women traits show they will make a fine leader, as they can keep themselves emotionally stable at most times. This helps when the job becomes especially stressful. They know how to take care of themselves, as well as others. This makes them a fine leader, as many bosses don’t know how to properly take care of their employees. A Scorpio lady will remember all of the good things that her underlings have done, as well as the bad. This will make promoting and firing people much easier for her. She makes sure not to let her emotions get in the way of making important decisions. The Scorpio woman characteristics show she will seem strange and mysterious to all that try to get to know her. She is not exactly quick to make friends. She will refuse to share her secrets with any new acquaintances. Instead she will only tell her secrets to her oldest and most trusted friends. She may act cold towards new people at first. A person needs to make an excellent impression when they first meet a Scorpio woman personality if they even want to be friends with her one day. She has no time for people who she thinks will waste her time or betray her trust. It all sounds like something out of a story, but Scorpio woman just knows who she wants to associate with and who she would rather ignore. The Scorpio woman personality traits show that when this Scorpion lady does talk to someone, she will make herself very clear. She isn’t one to be misunderstood, and when she is, she will be upset about it. She wants people to know exactly what she is saying when she is saying it. She will leave no room for misinformation to be found. Some celebrity Scorpio women may use this tactic while in interviews or while being seen by paparazzi so that rumors and gossip about them do not spread. The Scorpio female thinks highly of herself, and she would like others to think the same way about her. The Scorpio woman characteristics show she needs an honest relationship. If her partner cannot be trustworthy, then the relationship has no hope of working out. Although the Scorpio woman doesn’t want to depend on anyone, she will still want a stable partner. She will not have time for a partner that cannot be around when she needs them. If her partner can fulfill these simple requirements, then the two should have a blissful relationship. Thank you for letting us know. We will get it edited.